The Russian conductor Gennady Rozhdestvensky died on 16 June 2018 in Moscow at the age of 87, as the Moscow Tchaikovsky Conservatory announced. Rozhdestvensky was one of the most important conductors of the post-war period and maintained close relations with musicians, but also composers such as Alfred Schnittke, Sofia Gubaidulina and Edison Denisov from the Dairy to Dmitry Shostakovich. For more than six decades he gave concerts around the world, led the USSR Radio Symphony Orchestra and later the prestigious Bolshoi Theater in Moscow. Rozhdestvensky was the first conductor of the former Soviet Union, who was appointed chief conductor of foreign orchestras. For many years he directed the BBC Symphony Orchestra in London, the Vienna Symphony Orchestra and the Stockholm Royal Philharmonic Orchestra. He was married to the Russian pianist Wiktoria Postnikova, with whom he also gave many concerts and made recordings. In 1982 Gennady Rozhdestvensky initiated a concert in the Great Hall of the Moscow Conservatory on April 15, 1982, to create a march composed of a collective of authors titled "Swan, Cancer and Pike" for brass and percussion. Rozhdestvensky was then responsible for the drums part. The composer Alfred Schnittke later used this piece as the introduction and finale of his ballet "Skizzen". Gennady Rozhdestvensky also made an important contribution to the history of the well-known Gogol Suite by Alfred Schnittke. 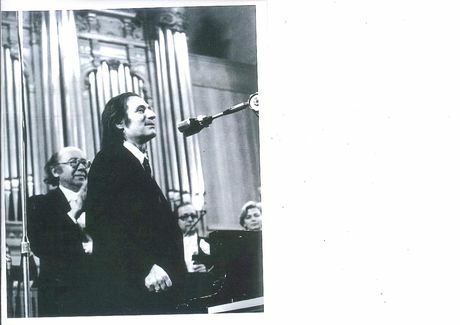 The complicated genesis of incidental music for Nikolai Gogol's play "The Revision List" began in 1976, when Yuri Lyubimov, director and director of the Moscow Taganka Theater, commissioned Schnittke to write the incidental music into an unusual Gogol spectacle. Schnittke had at that time, especially as a film and stage composer (music to over 40 films and to pieces by Shaw, Schiller, Pushkin and Brecht) achieved high artistic reputation. Apparently chaotically Ljubimow had mixed numerous Gogol fabrics ("The Nose", "The Auditor", "The Dead Souls", "The Mantle", "The Portrait", etc.) to a grandiose play, whereby his subtle feeling for the temporal Process and the mutual penetration of the actions to a sophisticated dramaturgy led. This way of working coincides with the principles of Schnittke, which uses his own and foreign, real and false quotes, re-composed and parts of early origin in his music. A change in the musical direction of the Taganka Theater meant that Gennady Rozhdestvensky, who had been engaged in the premiere of many orchestral works for Schnittke since 1963, took over the conducting of the stage music for the "History of the Auditor". Later, he came to the idea of assembling substantial parts of incidental music into a Gogol suite. The result of this work is now available in this remarkable new publication.